Last night Melissa, Trevor and I went to my Aunt's house to visit with her cousin who was here visiting. My Dad and Step Mom came too. We sat around and talked and then had dinner. My aunt made some baked chicken and baked potatoes. Simple, yet it was really nice! I don't know why I never think to invite people over for dinner. We always tend to go the fancy food route instead of just doing something nice and simple. 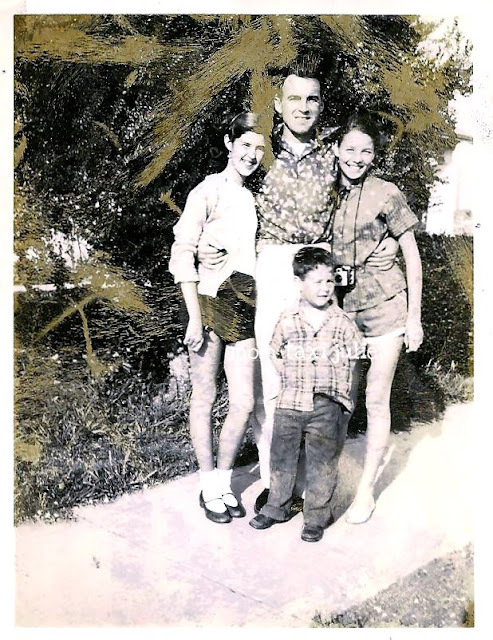 This is my Aunt Corine on the right, My dad is the little guy, their cousin Mary on the left and Mary's dad (who married my grandma's sister). I don't know why this picture has the gold marks on it. Maybe that was something my aunt did. I think the picture came from her. I love old pictures like this. Mary lives in Florida and has been coming to visit once a year. I think this is the first time I've actually met her. I was surprised to learn that her daughter lives just a few cities over. It was a nice visit and nice to meet more family. Simple dinners are lovely, I do them all the time! Love the old photo.